On Saturday, new Pope Francis took a quick helicopter ride from the Vatican to Castel Gandolfo, the summer papal retreat that is currently home to the guy now known as Pope Emeritus Benedict. After embracing on the tarmac, the two men — dressed in matching white, with Francis looking slightly fancier with his cape and sash — made their way into the chapel, where Francis refused the pew-of-honor because “we are brothers, we pray together.” (He later offered Benedict a statuette of the “Madonna of Humility” in appreciation for the “many signs of humility and gentleness in your pontificate.”) The prayer session was followed by lunch and private discussion in the library, where the pair discussed, among other issues, the secret VatiLeaks report Benedict commissioned shortly before his resignation. 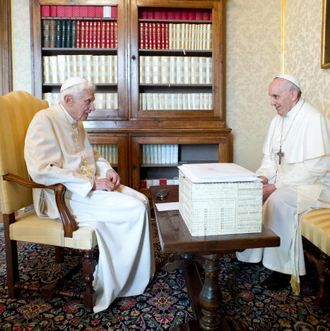 Afterward, Francis headed back to Rome, having confirmed that he has no immediate plans to throw his predecessor in prison, which is what happened the last time a current and former pope met.